Despite precautions, I once again managed to get frost nip/chilblains on my right hand during the most recent hard freeze here. I seem rather susceptible to this but at least I didn’t have any problem with the left or my feet this time. It very much puts a damper on my guitar playing, especially finger picking with sore fingertips. It also makes me leery of winter surfing — not that I have had time to get down to the Gulf (or much of anywhere else) lately. I probably will not travel much for the next month or so, anyway. What with flu season, I try to avoid being around people! February is time to start doing stuff to prepare for spring here on Peanut Road, transplanting trees, getting garden laid out, etc. I do intend to travel in March and am likely to show up down in the Dade City area for this year’s WillMcLean Festival. It has been something like eight years since I’ve made it down there. My niece Mary (Mean Mary James) will be performing again this year, so I am going to try to make a weekend of it and have the full camping experience. Mary will probably (it’s not absolutely certain yet) be at the Florida Folk Festival at the end of May, too. I shall try to make it over to White Springs for that, at least one day. In completely different news, I am finally abandoning the Yahoo Sitebuilder software I have used to build and maintain my sites for the past several years. I still like it but the latest round of problems (widespread inability to upload changes, and not well-handled by Yahoo) I have decided to go to a new site building approach. Of course, I could do it all as html, but I am too lazy for that. I could also switch to mostly Word Press-based sites, linked together with a few minimal pages. Some of that concept may or may not show up in the final product. I could also use a ‘responsive design’ program. With so many accessing pages via smart phones and such these days, it IS necessary to design with them in mind. However, the responsive sites I have visited via my desktop (I do not use any hand-held devices myself, other than a ‘dumb’ phone) look rather ugly and not really that functional on a large screen. So I’ll most likely go with a separate mobile site and redirects. Maybe not right away. Incidentally, I may change over to a smart phone or something like that before this year is over. Why? So I can use it to process credit cards, if need be. Need does not be at the moment, so I am not overly concerned about that right now. But I do think my phone is slowly dying so I’ll be replacing it eventually. Anyway, after a great deal of auditioning different website builders, I settled on Serif’s WebPlus. Decently priced (certainly way preferable to a subscription to Dreamweaver! ), does what I need pretty much. And I can move my sites readily to another server if I get fed up with Yahoo — not that I’ve ever had any problem with their hosting, just with their software. In other news, I continue to go through and revise all the titles from Arachis Press. About halfway through that task (well ahead of schedule) and starting in on the first Donzalo novel. New editions will be out of each of those books as I get them finished. So far, there are revised versions of the poetry books DREAMWINDS and PIECES OF THE MOON, the children’s book THE CONTRARY FAIRY, and the YA novel THE MIDDLE OF NOWHERE (THE ART OF K PAGE BROOKE and A MOUSE IS IN THE HOUSE needed no revision). 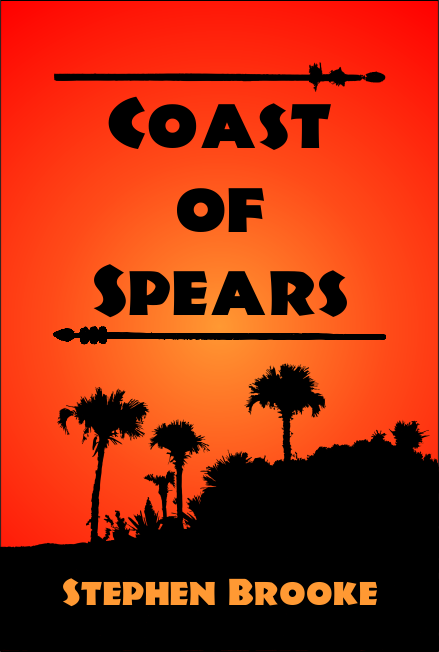 I am also continuing work on the new fantasy adventure novel, COAST OF SPEARS. At this point, mostly still working on the outline part of it — the actual writing does not take very long if the underlying structure is already built. This is why I don’t end up doing much revision of my stories after the first draft — it was already taken care of before I started!